Highlights of Fiesole. 6 hilly km. From Piazza Mino, take a quick 0.5 km jaunt up Via S. Francesco to the Monastery, back down, and then Vecchia Fiesolana to the Villa and the Fontelucente sanctuary. Dip back down and then LEFT on V. Giovanni Duprè, for 1.5 km, by the Tuscan walls, onto V. Delle Mura Etrusche. 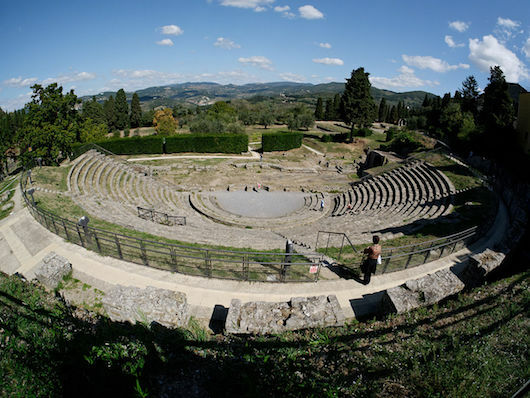 Back in the main part of Fiesole, you’ll then do a climb up to Monte Cecere. Take V. Filippo Mangani out of town to the Via Belvedere path, past the church, to V. Monte Cecere, to the end of V. Degli Scalpellini. Do a return loop, staying left on V. del Pelagaccio, to V. Francesco Poeti. Grand Tour. This is an 11 km run to the town the hillside town of Settignano. 1140 foot elevation gain. Wonderful views along a beautiful hillside run. We have put it together as a loop. From Fiesole, take V. Frà Giovanni da Fiesole Detto l’Angelico south to V.Benedetto da Maiano, through the town of Maiano. V. Gabriele D’Annunzio will take you into Settignano. From the town, head north on Via dei Cioli to the town of Montebeni, and then get on Rt. 55, which will turn into Rt. 54, heading west back to Fiesole. Note: narrow road in parts, no shoulder/sidewalk. Create your own route. From the main square, do some random running on some of the main streets, some of which are very narrow.